Click to download any of our informational flyers. Quality assurance becomes increasingly challenging as medical device, drug and biologic products move through the manufacturing process. 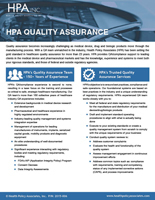 With a QA team unmatched in the industry, Health Policy Associates (HPA) has been setting the gold standard in healthcare quality assurance for more than 23 years. Successfully gaining FDA approval in the highly regulated field of dermal fillers and other cosmetic medical treatments requires expertly executed clinical trials, highly accurate data collection and analysis, and a thorough understanding of the application process. 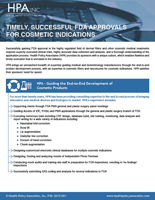 HPA brings an unmatched breadth of expertise guiding medical and biotechnology manufacturers through the end-to-end product development process, with an expertise in cosmetic fillers and neurotoxins for cosmetic indications. 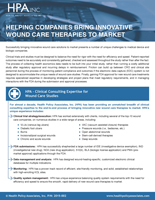 Successfully bringing innovative wound care solutions to market presents a number of unique challenges to medical device and biologic companies. For almost a decade, Health Policy Associates, Inc. (HPA) has been providing an unmatched breadth of clinical consulting expertise to the end-to-end process of bringing innovative new wound care therapies to market. As industry standards have evolved over the last 20+ years, HPA has nimbly responded to changing requirements and the particular needs of our clients. 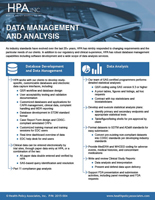 In addition to our regulatory and clinical experience, HPA has robust database management capabilities including software development and a wide scope of data analysis services. 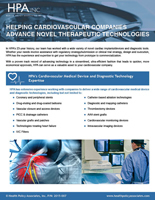 In HPA’s 23-year history, our team has worked with a wide variety of novel cardiac implants/devices and diagnostic tools. Whether your needs involve assistance with regulatory strategy/submission or clinical trial strategy, design and execution, HPA has the experience and expertise to get your technology from prototype to commercialization. 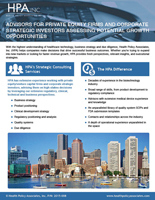 With the highest understanding of healthcare technology, business strategy and due diligence, Health Policy Associates, Inc. (HPA) helps companies make decisions that drive successful business outcomes. Whether you’re trying to expand into new markets or looking for faster revenue growth, HPA provides fresh perspectives, relevant insights, and executional strategies. 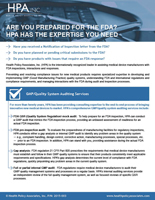 Preventing and resolving compliance issues for new medical products requires specialized expertise in developing and implementing GMP (Good Manufacturing Practice) quality systems, understanding FDA and international and compliance requirements, and managing interactions with the FDA during audit and inspection processes. Recent progress in cell and molecular biology, and improvements in our understanding of both stem and gene cell therapies have delivered us to a whole new frontier in medicine. 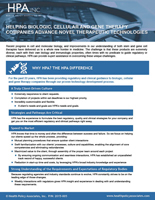 HPA can provide expert assistance in overcoming the unique challenges associated with bringing these therapies to market.